I am a bit of a brush fiend - I love how you can create different looks and shapes with certain brushes, and my favourite is when I find brushes I adore which don't cost the earth. The Duo-Fiber Collection from Real Techniques is a limited edition trio of brushes which fall into that category. 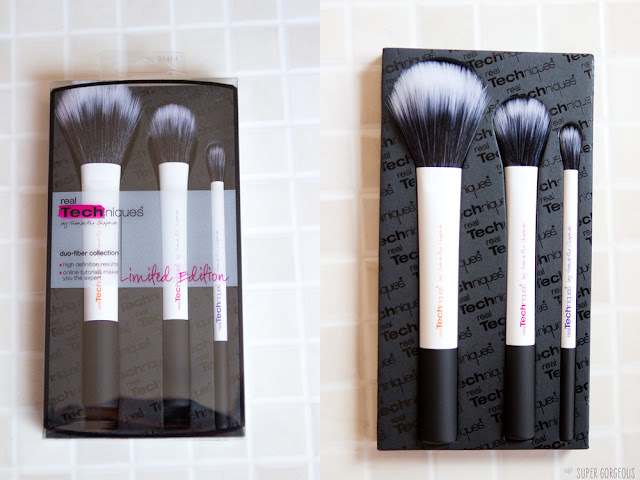 Inside the box is a Face brush, Contour brush and Eye brush with a sleek black and white handle, and black and white duo-fiber, handcut taklon bristles. It's the first duo-fiber collection from the range, but I hope this sparks off a whole new line for Real Techniques as I love them. The ferrule on each of the brushes is really long which means you get a lightweight application so can really build the product up in layers. The brushes are perfect for creams, liquids and powders so are really versatile. The name of the brush is on the handle, and follows the Real Techniques colour coding system - orange for the face, pink for finishing and purple for the eyes - the other ranges of brushes have the colour system as the colours of the brush handles making them super-easy for beginners to pick up and get to grips with without too much fuss, plus Sam's online tutorials are on hand for the best way to use the brushes with some ideas for looks, so they really are perfect for newbies as well as dab hands. The Face and Contour brushes are fairly flat - I like that in a brush - for my contour I normally squish down my normal powder brush to make it thinner... no more squishing! The Contour brush is absolutely gorgeous. I love it so much that I am definitely going to buy another so I can have one in my kit as well as my personal make up bag. It's the perfect size to nip in under the cheekbone and it deposits colour in a nice, even way. It's small enough that the thinner side can be used on the sides of the nose, and the fatter side can be used on the temples if you wanted to take your contour one step further. So much love for this brush! The Face brush is a little more flippity-floppity than I personally like for my own face - I like a nice dense, short haired brush as I like to pack my powder on, but for my kit - perfect. It picks up a small amount of powder to give a light sweep over the face. The fatter side can be used to pat colour on too, but as the bristles are long, as is the ferrule, it's a bit too much of a light application for me personally. If you like to powder just for a bit of insurance rather than a necessity (i.e. not a powder-ho like me!) then this brush will suit you fine. The Eye brush is rounded, the same width all the way round. The length of the bristles plus the fluffiness means eyeshadow goes on really nice and gently - I've found I can take my colour right into the crease with this and it gives a nice soft edge to the shadow. You could also use it for gentle blending or for adding soft colour or highlights, even highlight to the cheekbone. What amazes me most about this brush set is that it's only £23.99 - that's £8 per brush which is good going for brushes of such high standard - they launch in the UK in Boots on 20th May are limited edition, so grab them while you can! ohh these look really good! great post, i love your photography! These look great! Love love love the RT brushes. Must remember to pick some of these up before they sell out! These look lovely. Im a big fan of the original RT brushes. Im sure these are just as good! 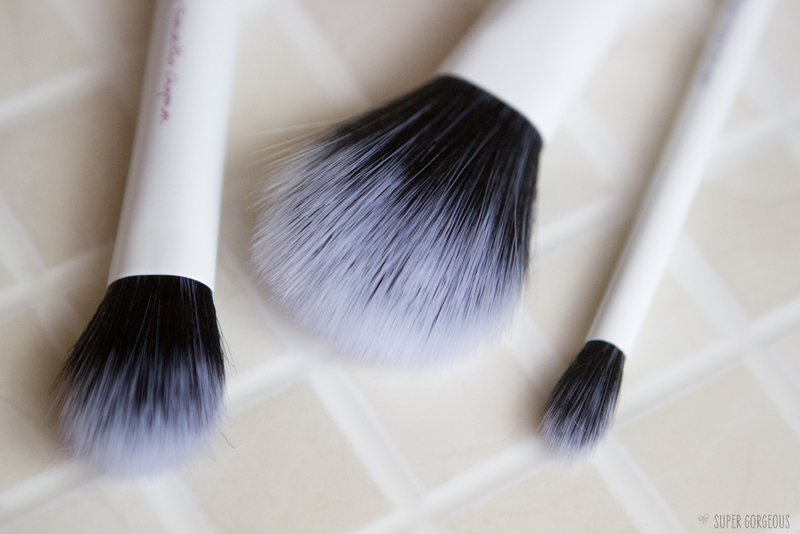 I'd never even heard of these brushes until I started reading beauty blogs. I need to get a set and see what all the fuss is, they sound great!